Gosh I LOVE photographing women. It really feeds my soul and sparks my creativity. Jasmine contacted me recently to set up a photo shoot. I've really been wanting to get out shooting more now that I'm feeling a bit more like myself since the birth of my second child in January, so it was a perfect opportunity to do something fun and creative. I've also been wanting to veer out of my comfort zone and experiment with using some different techniques and lighting scenarios, including breaking some traditional portrait rules by using light and shadow to create dramatic effects. 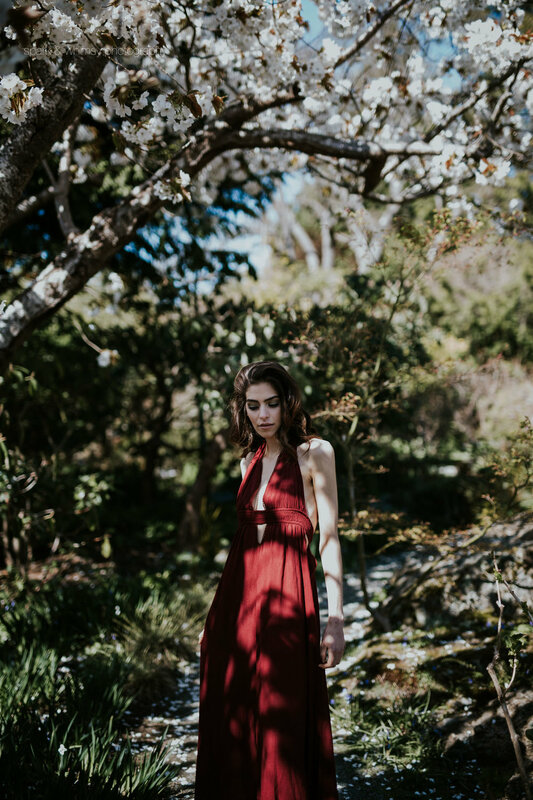 This weekend provided the perfect opportunity to work with some beautiful strong light and shadows on a much-needed sunny day here in Victoria after an unusually cold winter and early spring. We met at the beautiful Abkhazi Garden in Fairfield and I can safely say that we both really enjoyed being out in the sun and being WARM! Jasmine arrived looking stunning with hair and makeup by the talented Melanie Baird Makeup Artist. She wore a gorgeous red dress from Myrtle & Moss Props. It's too hard to pick my favourites, but here are some early contenders.